With Thanksgiving Day on the horizon, for many households the menu planning has already begun. Sweet potatoes or yams are always a well loved side to a Thanksgiving Day feast, and one we don’t typically like to mess with, as we all have a favorite recipe. This year I am going to keep my beloved sweet potatoes with marshmallows on top, but I am also going to give this new recipe a whirl! 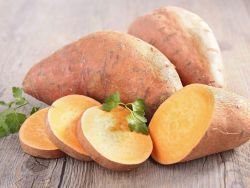 I found this easy recipe for Roasted Yams and Apples on campingcafe.com, along with plenty of other great Thanksgiving dishes that can just as easily be done in the RV as they can in your home kitchen. With only seven ingredients and ten easy steps, this is one that anybody can do! Click here for a full menu of RV and camping friendly Thanksgiving ideas. Bake yams for 50 minutes or until soft (microwave for 8-10 minutes if you prefer). Cool the yams until you can handle them. Peel yams and slice crosswise – to make round slices. In a shallow 1-quart baking dish, alternate apple rings and yam slices, overlapping the edges. In a small saucepan, combine sugar, cornstarch, cloves. Stir in orange juice and blend. Heat this mixture, stirring, until thickened. Pour over apples and yams. Top the dish with nuts and bake for 20 minutes or until the apples are tender.